Spontaneous dribble: I bought my first book! So I was sitting at the bus stop, cheeks firmly pressed against the cold aluminium bench. I don't know who designed it, but there seemed to be an abundance of sharp edges. Next to me sat a sour old woman, stone faced, she seemed to claim 80% of the bench for her mountain of cat food and knitting gear. She would regularly stare at me with a look that screamed "how dare you occupy this seat you insensitive little worm". It was 8:44 am, my bus was due at quarter to. I decided to peel off the pew and waltz over to the bus timetable sign. In the corner of my eye I noticed a hustle. Suddenly aware of the time, the old woman was frantically wrapping her ball of wool, stuffing her knitting needles away and sliding on her leathery gloves. She whipped out a pair of bug-eyed sunglasses from a concealed pocket of her coat and placed them over her wrinkly forehead, pursing her lips. She saw me at the front of the bus queue and hated it. With excellent limb management technique, she methodically collected her walking frame, bags of cat food, knitting gear and methodically shuffled her way towards me. I noticed a bus approaching in my peripherals. So did she. With no sense of urgency I casually turn around and prepared to board the imminent vehicle. I double checked the LED display screen on the side of the bus, expecting to see the familiar "197 - Macquarie University". It read "not in service". The woman turned to me in disgust, I assume she heard me. Regardless, she tried to jump in front of me, desperately flailing her arms to the bus driver like a lifeguard to someone without a bathing suit in the ocean. He refused to acknowledge her and drove right past. The next bus would arrive at 9:30am. I was pretty pissed off, I had missed my lecture and was now stranded in this deserted bus shelter with a woman 4 times older than me that reeked of tuna and felt entitled to queue jumping. To be fair, I intended to let her onto the bus first, but her assumption that I wasn't going to made me want to stand my ground. Walking through Mona Vale Main I came across Berkelouw books and decided to have a wander inside. 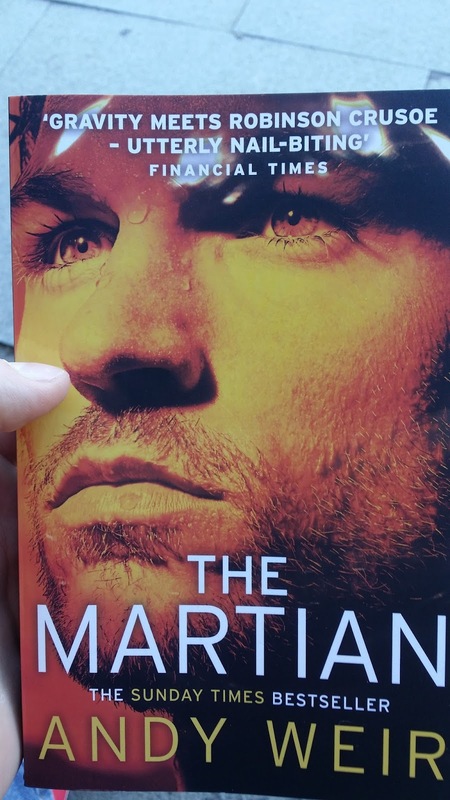 Instantly drawn to science fiction, I stumbled across "The Martian" by Andy Weir. My memory recalled that it was an upcoming film, and was endorsed by Adam Savage from Mythbusters. That's all the convincing I need! ....$20!... awwww man! I have always struggled to justify purchasing a book. Not that i'm cheap, it's just that the life of a uni student isn't the most luxurious past-time. It seemed a funny concept to me that you buy this item, read it, then leave it to occupy shelf space for the rest of your life. Why do I care what happens to it after I've read it?! 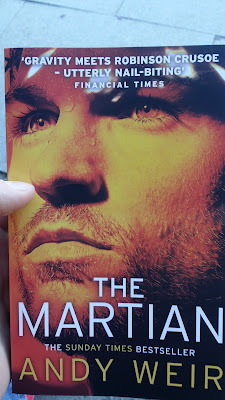 My impulsiveness kicked right in and I am now a proud owner of The Martian. This was the best $20 I have ever spent...(except that time Dan Murphy's had that sale on Vodka). This was in fact the first book I had ever purchased for myself. Yeah I know that's strange, but I was always given books as gifts for birthdays, Christmas or just borrowed them from libraries. It felt special to have one that was entirely mine to abuse, keep overdue, dog-ear and dribble on. I have never been so engaged in a book, Andy Weir's technical, engineering based genre of problem solving and science really appealed to me. He had clearly put a tremendous amount of research into the content and written a truly feasible story that directly portrays the future of adventure for mankind. Accompanied with a witty sense of humor, Weir kept my eyes glued to the pages and as a result I finished the book within a few days. The most enjoyable sensation regarding my ownership of the book was that I was able to really interact with it. If I came across a word I could not define, I would look it up and then write its definition on the page in pen. I would fill the book with silly illustrations, suggestions and stupid comments. It was such a gratifying experience that I now actively encourage people to not just read a book, but add to it! The next person to read it will be amused, this is the future of book borrowing: A dynamic, additive, open-ended source of literature. My wife was talking to a friend today she hadn't spoken to in a long time. Her friend recommended she read this blog written by a 3rd year Engineering student. Why one would do 3 years in Engineering to then start a career in writing is beyond me. I get the black and decker thing though. I even think the TV show has legs, although you don't need a degree for that. Anyway, I'm off to contemplate life whilst sitting on my stool that a friend made sitting by the banks of a river with nothing more than a couple of hand tools and some determination. Thanks for your blog. It lightens my day. Also gives me faith in generation Y, but you're the only one. This makes me delighted. Yes, I know! It's possibly the most indirect way to get into writing. But then again, how can I be expected to focus on one career path for a whole 3 years? Haha. Many of these posts won't evolve into anything extraordinary, however the content is safer here than in my scattered brain. Wow! Sounds like quite a guy, maybe some day he could make you a whole set? He's already given you a stool sample. Lay off that river water tough guy! Oh, and don't worry about the old chick. Her dogs were just jealous that she would be eating their food because the bus was late. Haha! "MMmmMMMm... entrails, snouts and trouts...nom nom nom".